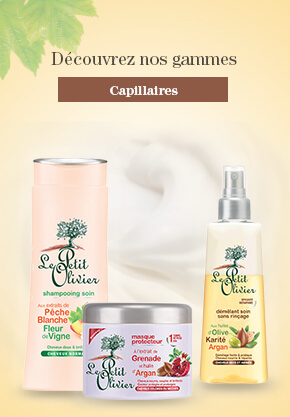 Chouchoutez votre peau avec cette sélection de produits essentiels pour le soin du visage. 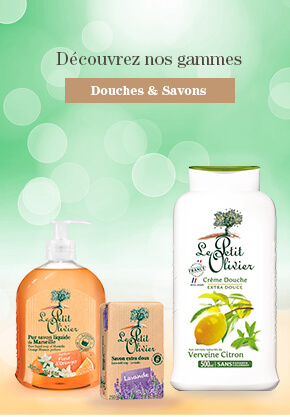 Ce produit vous rapporte 23 point(s) fidélité. A propos du programme. 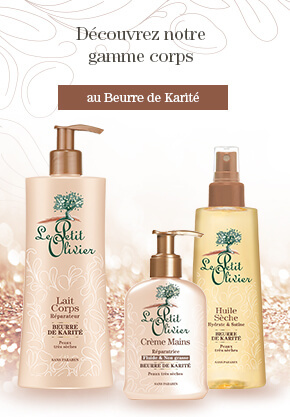 EAU MICELLAIRE - INGREDIENTS : AQUA (WATER) ; PROPANEDIOL ; PEG-6 CAPRYLIC/CAPRIC GLYCERIDES ; PEG-7 GLYCERYL COCOATE ; CAMELLIA SINENSIS LEAF EXTRACT ; CODIUM TOMENTOSUM EXTRACT ; CAPRYLYL/CAPRYL GLUCOSIDE ; BUTYLENE GLYCOL ; HYDROXYETHYLCELLULOSE ; PARFUM (FRAGRANCE) ; CETRIMONIUM BROMIDE ; TETRASODIUM GLUTAMATE DIACETATE ; CITRIC ACID. GOMMAGE VISAGE POUDRE DE NOYAUX D'OLIVE - INGREDIENTS : AQUA (WATER); SODIUM LAURETH SULFATE; ACRYLATES COPOLYMER; CAPRYLYL/CAPRYL GLUCOSIDE; COCAMIDOPROPYL BETAINE; DISODIUM LAURETH SULFOSUCCINATE; OLEA EUROPAEA (OLIVE) SEED POWDER; OLEA EUROPAEA (OLIVE) FRUIT OIL; GLYCERYL OLEATE; ETHYLHEXYLGLYCERIN; DECYLENE GLYCOL; COCO-GLUCOSIDE; SODIUM CHLORIDE; PARFUM (FRAGRANCE); SODIUM BENZOATE; POTASSIUM SORBATE; TOCOPHEROL; HYDROGENATED PALM GLYCERIDES CITRATE; SODIUM HYDROXIDE; CITRIC ACID. MASQUE VISAGE HYDRATANT HUILE D'OLIVE - INGREDIENTS : AQUA (WATER); OLEA EUROPAEA (OLIVE) FRUIT OIL; GLYCERIN; HYDROGENATED PALM KERNEL GLYCERIDES; CETYL ALCOHOL; DIMETHICONE; ETHYLHEXYL PALMITATE; ROSA DAMASCENA FLOWER WATER; CETEARETH-12; GLYCERYL STEARATE; TALC; HYDROXYETHYL ACRYLATE/SODIUM ACRYLOYLDIMETHYL TAURATE COPOLYMER; TOCOPHERYL ACETATE; SQUALANE; PROPANEDIOL; CAPRYLYL GLYCOL; ETHYLHEXYLGLYCERIN; HYDROGENATED PALM GLYCERIDES; POLYSORBATE 60; CARBOMER; PARFUM (FRAGRANCE); POTASSIUM SORBATE; SODIUM BENZOATE; TETRASODIUM GLUTAMATE DIACETATE; CAPRYLHYDROXAMIC ACID; SODIUM HYDROXIDE; CITRIC ACID; CI 42090 (BLUE 1). 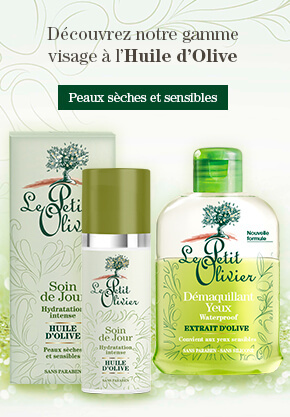 SOIN DE JOUR HYDRATATION INTENSE HUILE D'OLIVE - INGREDIENTS : AQUA (WATER); GLYCERIN; DECYL OLEATE; DIMETHICONE; OLEA EUROPAEA (OLIVE) FRUIT OIL; PROPANEDIOL; CETYL ALCOHOL; CETEARETH-12; GLYCERYL STEARATE; CYCLOPENTASILOXANE; ALOE BARBADENSIS LEAF JUICE POWDER; TOCOPHERYL ACETATE; C30-45 ALKYL CETEARYL DIMETHICONE CROSSPOLYMER; GLUCONOLACTONE; CALCIUM GLUCONATE; CARBOMER; PARFUM (FRAGRANCE); SODIUM BENZOATE; TOCOPHEROL; HYDROGENATED PALM GLYCERIDES CITRATE; TETRASODIUM GLUTAMATE DIACETATE; SODIUM HYDROXIDE.